The Mutter Museum, at the College of Physicians of Philadelphia, is one of the world’s most fascinating medical history museums. Its purpose is to educate, to shine a light on not only the history of medicine, but also explain diagnosis, treatment, and the mysterious wonders of the human body. 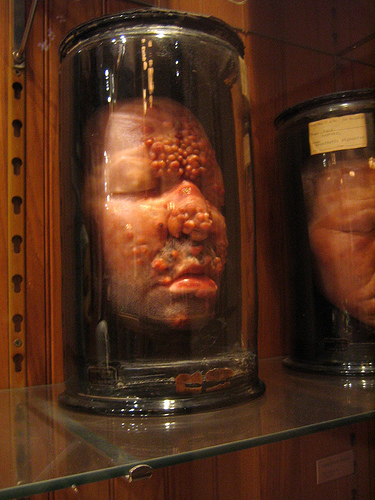 Its collection of anatomical specimens, medical instruments, and models are all displayed intimately in a traditional cabinet of curiosities arrangement. Highlights include a super-human-sized colon, shrunken heads, a model of a horn-like growth from a woman’s forehead, and tales of a 10-pound hairball removed from the stomach of someone with a prodigious follicular-appetite. All in all, the Mutter is disturbing, it is informative, it is morbidly fascinating, it is stomach turning, it is provocative, it is hideous, and it is beautiful. It certainly stands out among the other members of the museum world. Photo by istolethetv via Flickr. However, despite its uniqueness, the Mutter does have one thing in common with other museums: it needs to raise money for the upkeep of the collection. And, given the extreme competition for donation dollars in the non-profit world, that means it needs to get creative in its fundraising efforts. So, the museum decided to adopt. If zoo patrons can adopt a polar bear, and Art Institute of Chicago fans can adopt a dot from Seurat’s Sunday on La Grande Jatte, why can’t visitors to the Mutter Museum adopt something too? Enter the Hyrtl Skull Collection. Photo by He Shoots He Scores via Flickr. The Hyrtl Skull Collection consists of 139 skulls, which are over 150 years old and, as such, are in need of special care. They are an iconic component of the Mutter’s extensive collection, and, let’s face it, more likely to be adopted by a museum lover than a nausea-inducing jar of skin. Now through December 31—if you’re looking for a unique Christmas or Hanukkah gift, here you go—each skull is available for adoption for an annual subscription fee of $200. 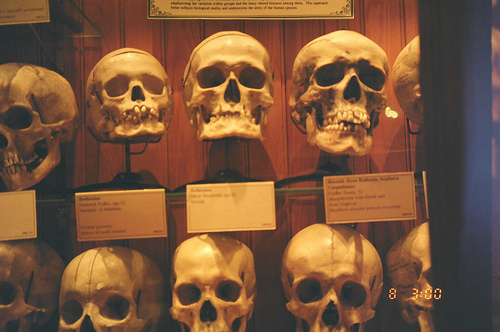 This money goes toward the conservation, research, and exhibition costs of each skull, and adopters will be identified as the proud patron of their skull in the Mutter Museum. A catalog of the Hyrtl Collection is available so that you can choose the skull that suits you best. Perhaps that is an unknown male from Amsterdam with turned up nasal bones, or the young fruit vendor Georg Prasnig who died in Vienna, or perhaps Orazio Trani—whose cause of death is unknown but his idiocy is apparently well established—is more your speed. Intrigued? 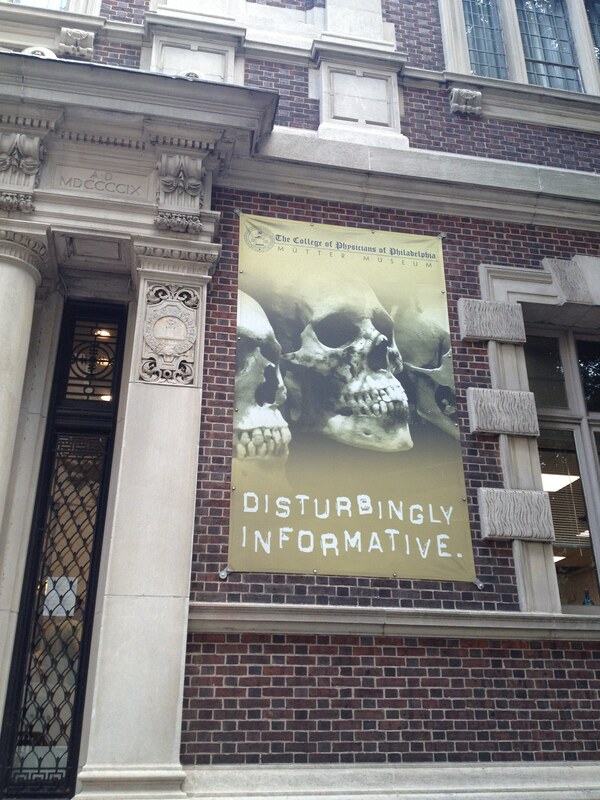 Visit here for more information about adopting one of the Mutter Museum’s skulls. Photo by Josh Staiger via Flickr. Tell us how you became interested in art history? When I was a kindergartener, my teacher introduced the class to Vincent van Gogh’s The Starry Night. As part of the lesson, my classmates and I each made our own renditions of the Post-Impressionist masterpiece. I was hooked. 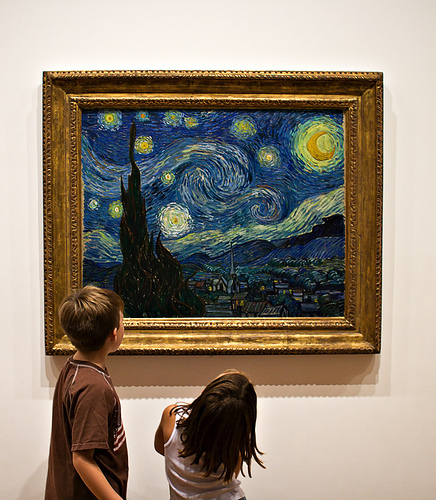 Five-year-old me successfully begged my parents to take me to see The Starry Night in person at the Museum of Modern Art in New York City—no small request given that we live near Philadelphia! Art history has been my passion ever since. You have a blog, Heartwork, on which you discuss your adventures in art history. What are your plans and hopes for the blog? Do you have a dream interview that you would like to conduct? Heartwork indeed follows my adventures in art history, from staging picture re-creations to baking edible artwork to visiting museums and more. I have some fun posts planned for the future! While I have not yet conducted interviews for the blog, I think that is a wonderful idea – it would be particularly interesting to talk to a museum curator or an art history author. My great hope is that other art history buffs submit their own creative art history projects to Heartwork. If people make their own picture re-creations, edible artwork, or other projects and then email pictures to emilybz@comcast.net, I would be thrilled to post their work on the blog. 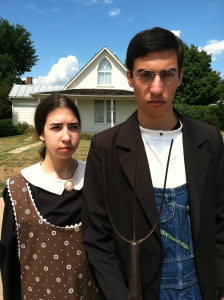 Emily and her brother recreate American Gothic. On your blog, you often stage picture reproductions (like Whistler’s Mother and American Gothic), do you have a dream painting that you would like to reproduce? So far, I have re-created Grant Wood’s American Gothic, Norman Rockwell’s Freedom from Want, James McNeill Whistler’s Whistler’s Mother, and Leonardo da Vinci’s Vitruvian Man. Which re-creations I stage are dictated by the costumes, props, settings, and numbers of people that I have available, so it is fun to think about what paintings I would re-create without these limitations! 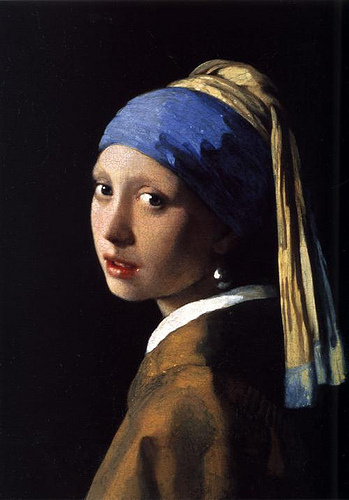 I would love to re-create Johannes Vermeer’s Girl with a Pearl Earring and da Vinci’s Mona Lisa. If I could gather a large group of people, it would also be a ball to stage Pierre-Auguste Renoir’s Luncheon of the Boating Party and Georges Seurat’s Sunday on the Island of La Grande Jatte! As an art history buff, do you feel that knowing the story behind a work of art or its art historical context is an integral element in appreciating that work of art? Can you give us an example of a particular artwork that you appreciated more or less once you learned about its story or context? I absolutely believe that these factors are crucial for a viewer to fully understand a piece. From my own experience, my appreciation of artwork increased after I took AP Art History last year and learned about the stories and art historical contexts behind works of art. On a related note, Heartwork’s message is that art history is more entertaining for people when they make their own connections with artwork. For example, after creating a version of The Starry Night in cupcakes or re-creating Whistler’s Mother, I found new meaning and delight in these paintings. So, you’re still a teenager…any dreams of working in museums one day? I would love to work in museums one day! This summer, I got my feet wet in the museum world by serving as a one-day shadow at the National Portrait Gallery, the Philadelphia Museum of Art, and the Corcoran Gallery of Art. I also was delighted to volunteer at the University of Pennsylvania Museum of Archaeology and Anthropology’s summer camp. Through all of these experiences, I greatly enjoyed meeting museum staff members and getting a behind-the-scenes peek at what it takes to run a museum. Photo by kimadababe via Flickr. Are there any art history-related books that you particularly like or would recommend to others interested in the field? It would also be a dream come true to write my own art history-inspired novels one day. As both an art history enthusiast and an avid writer, I wrote Once Upon a Masterpiece: An Art History Adventure, a storybook designed to introduce young children to the joys of art history. To help save the arts in schools that are facing budget cuts, I donated copies of the book to dozens of elementary schools in the School District of Philadelphia. History explorer and museum enthusiast Don Wildman hosts Travel Channel's "Mysteries at the Museum." For the last five television seasons I’ve hosted Mysteries at the Museum on Travel Channel, a show that takes its audience on a weekly odyssey deep into the archives of American museums. In each episode, we learn from curators and experts about the historical significance of an array of remarkable artifacts. For a museum lover like me, hosting this series is nothing less than a dream job. I was raised just outside of Philadelphia, a city famous for its esteemed museum culture, with places like the Academy of Natural Sciences, the Barnes Foundation, Mutter Museum, and the Philadelphia Museum of Art. The place is cram-packed with institutions. Not to mention, you can hardly turn a corner on the street without walking into a major moment of our nation’s heritage. Philly instilled in me a deep appreciation of the past as it affects our present—and museums, of course, were central to this experience. So imagine, decades later, when I was tapped to host a show about museums. Amazing! It has been a lucky passage for me. For my entire life, I’ve been a happy outsider when visiting museums—paying my admission fee, bending the metal tag onto my collar, and strolling purposefully through galleries. I’m still an outsider but having met so many museum pros in my work, my appreciation of the business of exhibition has soared. It’s like anything, I suppose—restaurants, theater, certainly television. Whenever you get to peek behind the curtain and see the humanity at work, it’s a reality check. But in the case of museum management, I’ve been only astonished by the passion and intelligence involved in telling the stories of collections. From near or far, it’s a really smart business to examine. 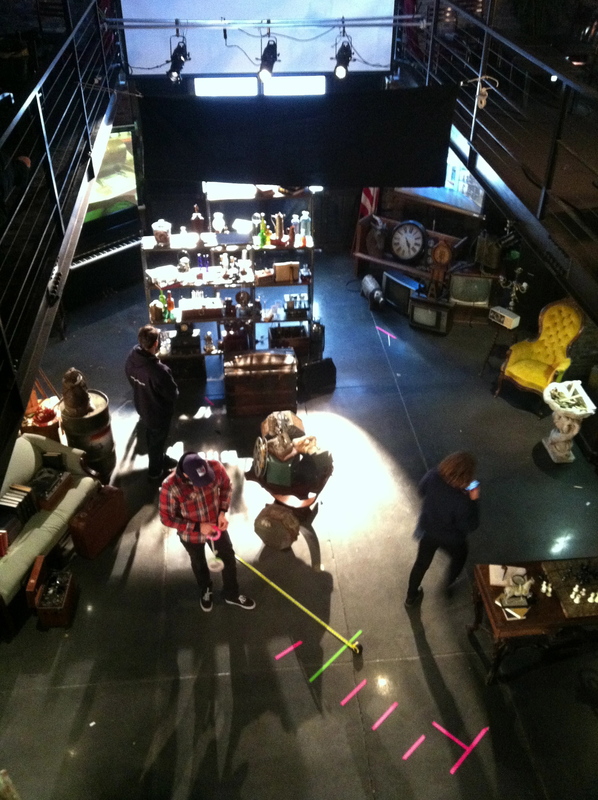 Travel Channel's "Mysteries at the Museum" crew sets up to film the next segment. We do our own kind of curatorship on the show. At least, I like to think of it this way. Mysteries at the Museum is about artifacts, five or six different ones in each episode. Our production team of around thirty-five researchers, editors, and producers (and one host!) finds the artifacts and develops the segments. But any museum curator knows an artifact is basically just an object if you don’t have the story behind it. So we have to vet each artifact considered on the series for the quality of its tale. Does it have a mystery? Do we care about the characters involved? Is there a takeaway for the audience? What’s the “huh? !” factor? That final criterion probably has more to do with the show’s success than any other element. If we’ve done our job right, we’ve made each artifact’s story relevant to a modern audience and provided a revelation, large or small. Before Mysteries at the Museum, I was a down-in-the-muck action guy on Off Limits, another Travel Channel series that climbed me through the gnarliest spaces of our nation’s infrastructure, discussing history and engineering. How did Boston clean up its filthy harbor? Well, let’s rappel into a disgusting sewage interceptor and find out! It wasn’t enough to stand and point at a Colorado gold mine and say “whoa.” I had to dynamite a mountainside. You see, it’s modern TV; you can’t host it if you’re not willing to be punished for it. So much of life now involves this “do or die” immediacy. For better or worse, we are no longer a society that stands back and watches—and the same certainly holds true for museums. Those strolling minions are expecting more. 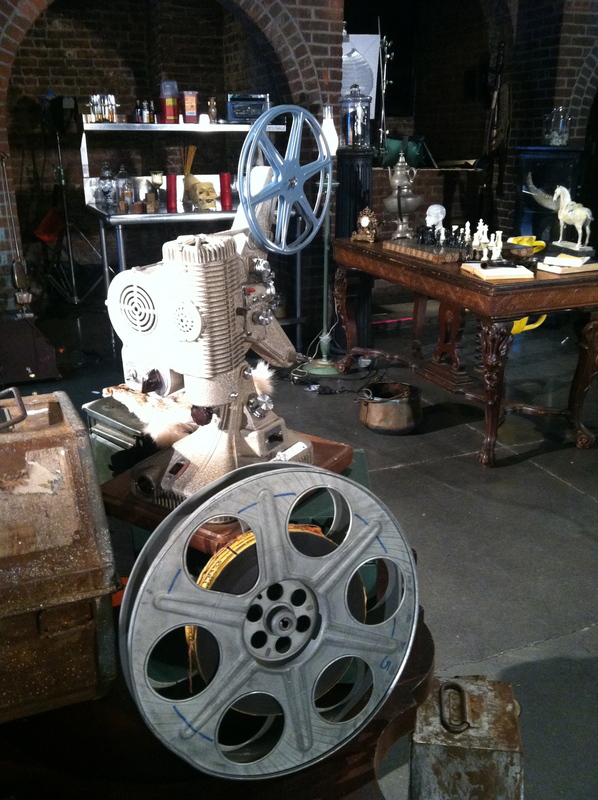 Props on the set of Travel Channel's "Mysteries at the Museum." It was the remote that changed television. In museums, I suppose, it’s the competition. There are more than 17,500 museums in America containing over a billion artifacts. But the fact that people visit US museums some 850 million times every year represents a rather rich potential. On Mysteries at the Museum, we eagerly dive into it every week, trusting that what makes people watch our show is the same curiosity that takes them so many times to so many museums. At heart, people want to learn. And people want to look at stuff. This year, Travel Channel spun off another series called Monumental Mysteries in which I get to tell the stories behind iconic American monuments. Many of our same team work on both shows. But Mysteries at the Museum is the original and a true gratification for all involved. In today’s television marketplace, a series with the word museum in the title is a pretty rare commodity—one that makes us very proud indeed. For the past few years, Don Wildman has held one of the museum world’s dream jobs: host of Mysteries at the Museum, which airs on Thursdays at 9pm ET/PT on Travel Channel. To prepare for the fifth season, which premieres this Thursday, August 15, check out Don’s most shocking museum mysteries here.